CROWN HEIGHTS, Brooklyn [CHI] — As is a long standing tradition, every Motzoai Shabbos Chanukah all the Mitzvah Tanks, that are busy doing Chanukah Mivtzoim every day, set out from 770 in Crown Heights on a parade to Grand Army Plaza in Manhattan where they pass by as they light the worlds biggest Menorah. More pictures in the Extneded Article! TUCSON, AZ [CHI] — Last week Chabd of Tucson held their annual olive press demonstration in the Foothills Mall. The presentation was enjoyed by many. Rabbi Shemtov, Yossi Beenstock and Shraga Putter entertained the crowd with the fascinating story of Channuka. Children were called up to help with the pressing of the olives and were given a Dreidle to take home with them. TODAY: Menorah Mania at the JCM! CROWN HEIGHTS, Broooklyn [CHI] — Parents and Kids! 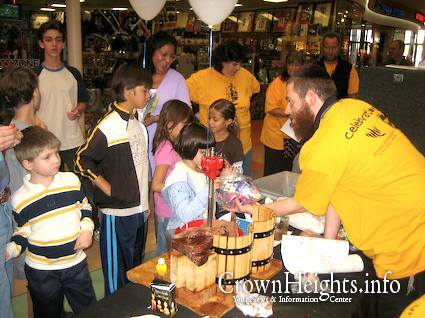 For the next three days of Chanukah here is an activity for the whole family, right here in Crown Heights! The activity includes hands-on exhibits as well as arts and crafts a live game show and a mini golf course, all right here in the Jewish Childrens Museum on Eastern Pkwy. Admission is $10 and the programs are runing through December 12th. For more information please view the flyer in the Extened Article! Ben Volin, 7, gazes at a menorah-shaped ice sculpture on Tuesday at Lerner Jewish Day School. Ben is a first-grader at the school, which hosted Chabad of Durham and Chapel Hill’s Hanukkah celebration. CHAPEL HILL, NC — One of 10 public menorahs — and perhaps the most unique — between Durham and Chapel Hill was kindled Tuesday, the first night of Hanukkah, at the Lerner Jewish Day School in Durham. SYDNEY, Australia — Rabbi Mendy Litzman arrived in Sydney from New York four and a half years ago. After studying here, he went to America to do his smicha (studies to become a Rabbi). We in Sydney are fortunate that he then returned to marry his wife Dani, and they have made their home here. A certified paramedic working with Hatzolah in America, Mendy often responded to medical emergencies around him, and he saw an urgent need for something more structured. He knew that Hatzolah would be the answer. Hatzolah is known as “Community first responders”, and is now an established medical emergency response service. Tonight, Motzai Shabbos, the 5th night of Chanukah, a parade of 25 Mitzvah Tanks and 130 Menorah cars will leave to Manhattan from Crown Heights. All who have Menorahs on their car are requested to participate! Meeting point: on President bet. Kingston & Albany at 6:45pm we apologies but cars without Menorahs will not be able to join. More information in the Extended Article! Supreme Court Justice Michael Cherry lights a menorah during a ceremony with Gov. Jim Gibbons, left, on Thursday night at the Capitol. Members of the Jewish community from around the state attended the ceremony, which was sponsored by the Chabad of Southern Nevada. (Photo by Cathleen Allison). CARSON CITY, NV — Gov. Jim Gibbons’ Capitol office took center stage Thursday for a ceremony honoring the third night of the Festival of Lights, with representatives of Nevada’s Jewish community participating in the lighting of a menorah. Gibbons helped Supreme Court Justice Michael Cherry in the lighting ceremony central to the Hanukkah holiday and played dreidel for chocolate coins with children from two Nevada Jewish schools. A dreidel is a spinning top that is part of the celebration.